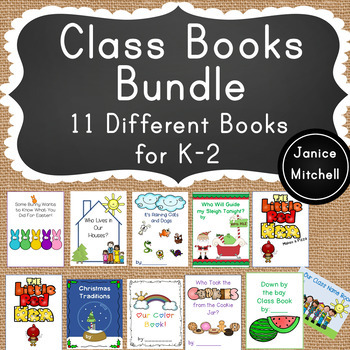 Class Books bundle contains 11 classbooks perfect for your K-2 classroom. Student love to read their peers' writing and their own writing. Each of these books are sold individually in my store. With these bundle each class book is only $1.36! In each book, students will write and draw to create a class book. A number of the books have additional vocabulary pages and poems to read. Each book contains teacher instructions. This book is perfect for the first few days of school. Students will write their name in the rectangle and then count the number of letters to complete the sentence. Included in this book is the poem I am. Great addition to your colors unit. This book will have students reading their color words in no time. Students will complete the sentence ‘A is .’ For example, a banana is yellow. Included in this book is a color word vocabulary page and the poem I Can Sing a Rainbow. Who Lives in Our Houses? Who lives in your house is a great activity for getting to know your students. Students will use the chart and glue squares on their page to show who lives in their house. Included is a vocabulary page of family words. It’s Raining Cats and Dogs is sure to make your students giggle! Mine sure did! Students will complete the sentence it’s raining…and…! and then illustrate their sentence. Afterwards, you will be left with class book of silly sentences and even funnier pictures! Included in this the book is a vocabulary page so your students can practice reading rain related words and the poem It’s Raining, It’s Pouring! What kid doesn’t love the song Down by the Bay! This class book will get them singing the song over and over again! Students will think of their own silly rhyme and write and illustrate it in this book. All students love the book Who Took the Cookie from the Cookie Jar? so why not write their own! Students will fill in the blanks and draw a self-portrait to complete their own page of the book. The surprise ending will have your students’ roaring! Included in this book is the reader’s theatre of the story. is a pizza related vocabulary page. is a bread related vocabulary page. Merry Christmas! This book is great for the last few days before Christmas! Students will write and illustrate their family’s Christmas traditions. Included is the song Jingle Bells that I know every student loves to read and sing! This activity is a great addition to the I Belong section (1.1.2) of the Grade 1 Manitoba Social Studies curriculum. Merry Christmas! This book is great for the last few days before Christmas! After reading, Who Will Guide my Sleigh Tonight? students will make their own page of the book. They will choose an animal who they think will be able to help Santa but then…they need to think of a reason why it would not be a good choice. For example, Santa tried alligators but they chomped through the reins. Included in this book are an animal vocabulary page and the poem 8 Little Reindeer. I love to hear about traditions of my students so why not read about them as well! Students will write about their family’s Easter traditions and then illustrate it in this class book, Easter Traditions in my Family. Included in this book are an Easter vocabulary page and an Easter egg poem. This activity is a great addition to the I Belong section (1.1.2) of the Grade 1 Manitoba Social Studies curriculum.